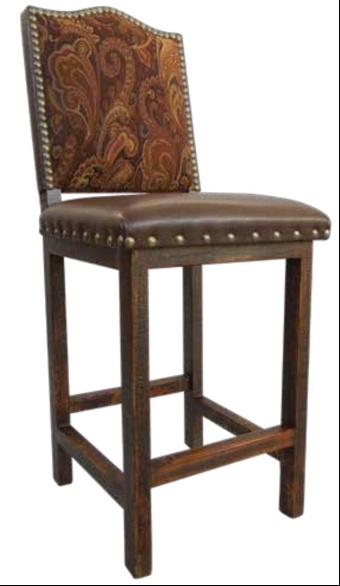 An elegant and sturdy hacienda style bar stool for your many welcoming gatherings, meals and memories. Images of a Spanish or Mexican hacienda bring to our mind a sense of abundance, working, sharing, being with others. A hacienda-type home, whether in Mexico, Spain, Texas, Colorado or Santa Barbara … needs furniture worthy of this warmth, wealth and hospitality. Enter the Hacienda Tuscan Stool -- sturdy richly colored legs, comfortable bonded leather seat with gorgeous upholstery back. Sturdy solid kiln dried pine, lovely dark finish, nail heads. A wonderful bar stool for your many welcoming gatherings, meals and memories.